Discover news, events and resources from NASA's Museum Alliance and its community of informal educators using the excitement of space exploration and scientific discovery to inspire new generations. 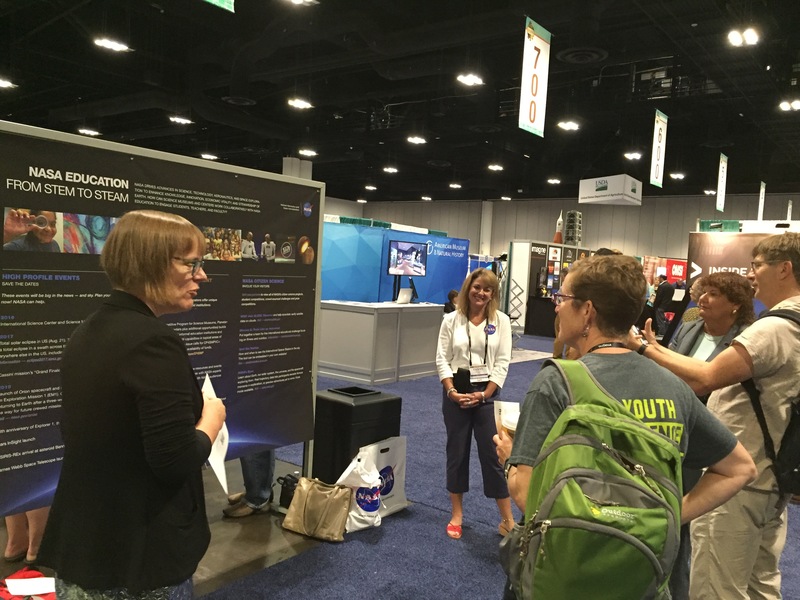 NASA’s Journey to Mars and Universe of Learning booths were hot spots. Institutes interested in presenting the future of human space exploration, answering big questions about how our universe works, or taking a virtual tour via Eyes on Exoplanets kept the staff busy. Attendees learned how they could get involved with various NASA programs designed for museums and science centers. At the Live Demonstration Hour, actor Douglas Coler performed a play about the Gemini 4 spacewalk, which recently earned playwright Chris Bresky from the Adler Planetarium an award from the International Museum Theater Alliance. Also at the demo hour, the Orlando Science Center’s Stephanie Kazmierzak and her four brave volunteers wowed the crowd with this engineering demonstration/party trick. 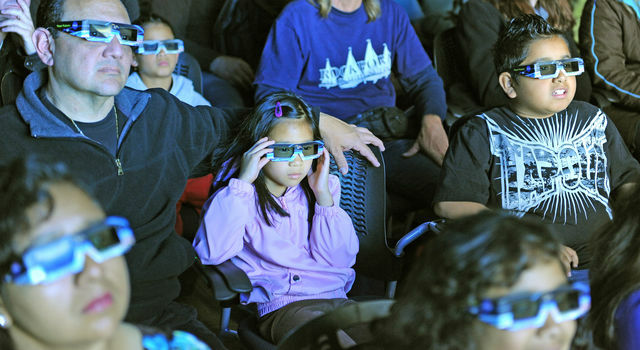 The agency’s Competitive Program for Science Museums, Planetariums, and NASA Visitor Centers provides funding in support of NASA-related content. 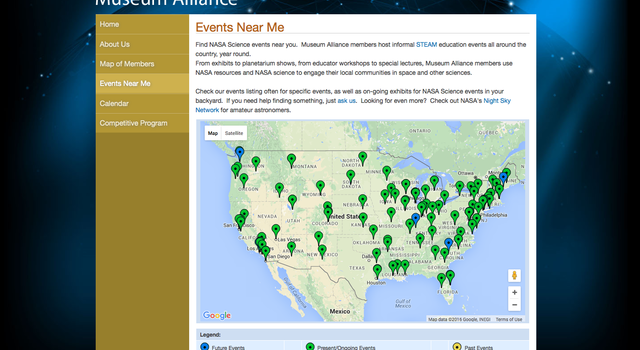 (Check out the Map of Awardees to see what NASA content might be in a museum near you.) Many of the grantees attended the conference and shared project updates. The Children’s Museum of Indianapolis, for instance, just opened its International Space Station exhibit, Beyond Spaceship Earth, and lets visitors see what its like to be an astronaut. Can’t make it to the museum? There’s an app for that! The Discover NASA exhibit for libraries has been reaching about 20,000 people at each site it visits, with hosts putting on all kinds of related special programming. Check out the schedule to see if it’s coming to a library near you. Another awardee, GirlStart, provides students with STEM learning via after school classes, festivals and summer camps. Its DeSTEMber celebration is available for anyone, anytime. The daily hands-on activities are designed for families to do at home, together. With more than 600 members in nearly 50 countries, the Association of Science-Technology Centers has quite a lot going on. Luckily, there’s an online search tool so you can find out what’s happening at a member center near you! Maybe you can even see what dinosaur they ended up picking out. At museums, people can get involved with NASA science and participate in hands-on learning, and now, thanks to a new app from the agency, they can take the experience with them through citizen science. The GLOBE Observer app invites people of all ages around the world to contribute to the agency’s Earth-science missions by making their own observations about the planet to complement those made by satellites. Students and others have already been collecting, sharing, and analyzing Earth data on the GLOBE program website for more than 20 years through schools, museums and after-school programs. The app provides a new way for individuals to join in and add to the data sets of more than 100 million measurements. The GLOBE Observer app will eventually feature a number of citizen-science projects, but the inaugural project, called GLOBE Clouds, will ask users to collect local data that can help scientists interpret satellite observations of clouds – a critical indicator for understanding climate and climate change. No special knowledge is needed to use the app, but participants will probably learn something new! The app walks users through recording sky conditions and cloud types, plus taking photos of what they see. Future projects on the app will let citizen scientists assist with monitoring land-cover and mosquito populations. Museums and science organizations are getting involved too by setting up accounts that let teams of citizen scientists collect data on their behalf. In fact, in honor of International Science Center and Science Museum Day (November 10, 2016) people are encouraged to register for the app through their local science institutions to join a worldwide experiment. Get started using GLOBE Observer by downloading the app, available for iOS and Android devices. Find out more during a Facebook Live event on the NASA Earth page on September 12 at 3:30 p.m. PDT that will introduce the project, the missions it supports and answer audience questions. At a museum, science center, library, camp or other informal education institution? Learn how to put together your own GLOBE Observer team account here, or how you can join the more than 700 organizations participating in NASA’s Museum Alliance here. You’ve probably heard about some of the fascinating missions and science happening at NASA, but wouldn’t it be great if you could see it in person? You can! Every day, hundreds of museums, planetariums, observatories, libraries and other institutions participating in NASA’s Museum Alliance offer exhibits, planetarium shows and events featuring NASA science, technology and engineering. As the school year comes to a close, you can keep students – and learners of all ages – engaged by visiting your local informal education institutions. So make May the month you plan your next museum adventure and support organizations that bring the inspiration of NASA to you! Not sure where to start? Use the Museum Alliance's "Map of Members" to find destinations near you or explore the dynamic “Events Near Me” map, which lets you search by date to find the latest offerings. For example, this month you could check out the new exhibits Out of this World: A Space Adventure at The Living Arts & Science Center in Lexington, Kentucky, or the Discover NASA traveling exhibition at the Auburn Public Library in Maine. You could experience “Intergalactic: A Space Odyssey” in the digital dome theater of Mid-America Science Museum in Hot Springs, Arkansas. Or, also this month, join the fun in California at the San Diego Air & Space Museum’s Space Day 2016, or sign up for the New Mexico Museum of Space History’s Rocketeer Academy summer camps. Every year, more visits are made to U.S. museums – more than 850 million – than to all major sporting events and theme parks combined. Americans love their museums - get out there and see why! 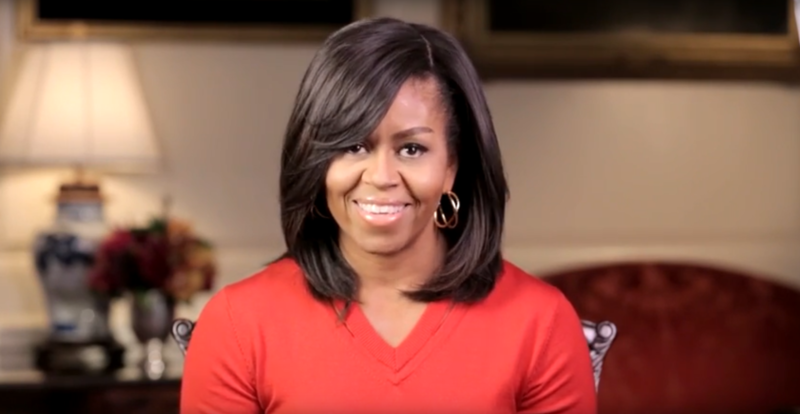 On March 12, the Smithsonian Institution will sponsor a special edition of Museum Day Live, an annual nationwide event designed to get people into their local museums, science centers and other cultural institutions. Taking place during Women’s History Month, the event is meant for all visitors but is specially themed toward inspiring the nation’s girls. Participating institutions will offer free admission for the day. 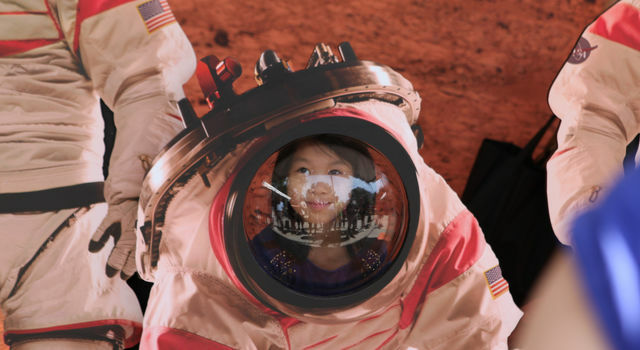 NASA plans to have strong participation through its Museum Alliance, a community of not just museums, but also planetariums, science centers, libraries, parks, observatories and other youth-serving STEM organizations. For a list of the more than 350 participating institutions and to get your free tickets, visit the event website. To learn more about getting your museum involved, contact Amelia.J.Chapman@jpl.nasa.gov. 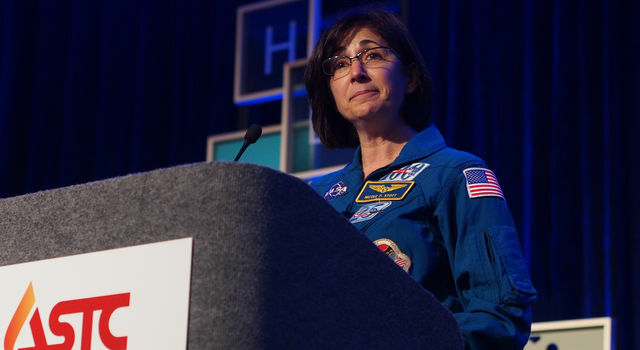 Also, check out these tips for Engaging Girls in STEM, including ways the public can connect with NASA! Quick! What do you think when you hear “Education”? Since 2002, JPL’s Informal Education group has run NASA’s Museum Alliance, providing museums and other informal education institutions with access to NASA staff, resources and professional development. More than 700 organizations around the world – not just museums, but also planetariums, science centers, libraries, parks, observatories, camps, nature centers, and youth-serving organizations – are Museum Alliance members. They in turn share those NASA resources with their own audiences, through exhibitions and programming. Last summer’s historic flyby of Pluto illustrates the impact of this approach. Museum Alliance members were kept up to date on the mission and image-release timeline, received New Horizons giveaways for their visitors, were able to speak directly with mission scientists, received training on related hands-on activities, and were given all the latest links, social media resources and downloadable graphics. Numerically, these Museum Alliance organizations put on almost 2,000 Pluto-focused events in 36 states and eight countries. But more important, they were able to use this teachable moment to serve their audiences – diverse audiences who came with a broad range of experiences and interests. They helped people learn when no one “had to” learn anything – and not just about Pluto. Every day, Museum Alliance members build on the intrinsically inspiring work of NASA in order to encourage people’s natural drive to know more, a drive that is itself at the heart of NASA’s mission. 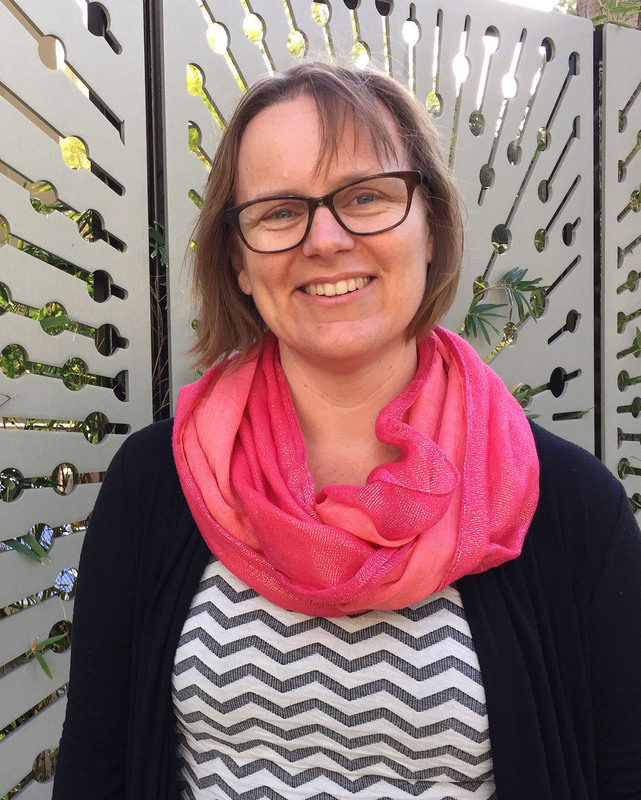 > Visit the Museum Alliance website to learn more about the program and its members.